Happy Bloggers Challenge Friday! This week I gave the talented Challenge Team a color combination, use Red, Black, and White. With Valentine's right around the corner, I'm sure they'll load you up with inspiration! For my card I used SCS Sketch Challenge 266 as my layout inspiration. The yummy pattern papers are from the Bittersweet Collection by Basic Grey. I stamped the image the Artistic Outpost Cutie Pie plate in Black Archival Ink on Watercolor Paper, then added color with the Marker Watercoloring Technique. I used the Bow Easy to tie the Riped Tomato Satin Ribbon, the XOXO was stamped in Ranger Barn Red Distress Ink. Thanks so much for stopping by! If your looking for more inspiration using these colors, be sure to click on the Bloggers Challenge Logo on my sidebar to see what the other players created this week, we've got a few new faces on the team, be sure to drop by and say hi! OMG your card is so stinkin' cute. I love that beautiful ribbon and the cupie doll art piece. Great use of the colors! Love your vintage style...this little girl is so cute and the pop of red is perfect! Very vintage! I like the use of all the patterns together. what's not to love about your card...Sweetie Pie is one of my favorite sets. I really like the PP and the way your did your ribbon..
Great vintage feel you've got going on here Lisa! I love that image ~ fantastic job! Luvin' this VD Cutie and what you did with her....that beautiful bow sets the card off just perfect! Another beautiful vintage card, Lisa!!! So striking!! How sweet is this card. Love the Vintage image and feel of your card and oh that bow...I've got to get one of those Bow Easy's. cute little vintage girl, I wish my bows looked that good! FUN card - love that image and now I have to buy that bow maker! My bows STINK!!! LOL Great vintage card, Lisa! TFS! What an adorable card! Very cute little girl and all the patterns together for a vintage look! So pretty, and don't you just love those Bittersweet papers?! Super cute and so Lisa! Wonderful card, Lisa! Love how you used the sketch and that bow is PERFECT! Very pretty! Great vintage image! Love your sweet image- she is adorable! I love the BG papers you used- and the gorgeous bow too. Fabulous card! Oh, too cute! Those vintage valentines are so sweet! Great job, Lisa! What an adorable vintage image! It's perfect with these colors. 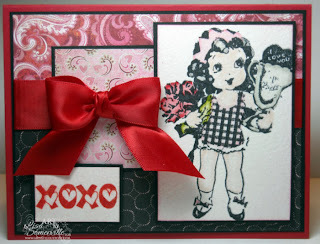 Love your vintage card and that girl image is too cute!!! You rocked this challenge!! This DSP is fabulous and the way you combined it rocks. Love the image and how vintage this feels. Way to put it all together! Love this card. That little girl is so cute. Great job with the papers and layout. Too cute! Love that little gal! Ohhh she's just the cutest thing! A real "winner" in my book! I see lots of us played along--very elegant projects!